You are here: Home » Partisan Show OK for Coach Chryst but not Bucky Imitator? Is Wisconsin’s flagship university more concerned about protecting the reputation of its sports mascot more than the image of its head football coach? Did it quickly condemn one partisan appearance and give a pass to another? Is there a double standard at work for Buckingham U. Badger and Paul Chryst? 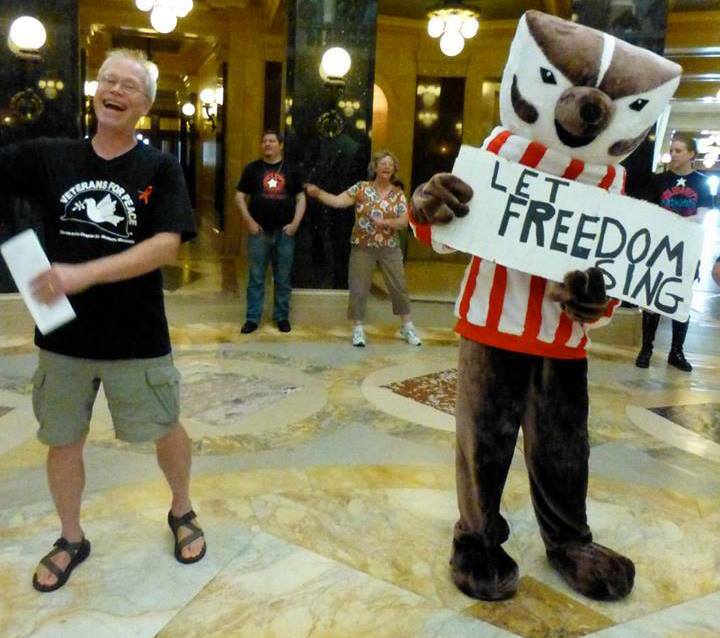 This story starts in September 2013 when someone (never publicly identified) in a Bucky Badger costume first showed up at the State Capitol for the noon Solidarity Sing Along, the long-running protest (1,036 straight weekdays and counting) of the Republican tea party’s complete takeover of state government. “Bucky” held a sign saying “Let Freedom Sing,” referring to recent mass arrests of singers as young as 14 and as old as 85. Bucky imitator attends the Solidarity Sing Along in September 2013. Photo by Erica Case. Of course this was big news to the mainstream media, and the conservative outrage machine collapsed immediately on its fainting couch. 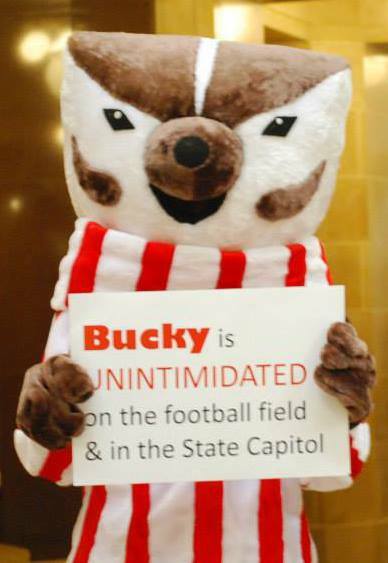 “Knockoff Bucky Badger has UW officials seeing red” said a Journal Sentinel story. UW officials ordered Collegiate Licensing Co. to send a cease-and-desist letter to a firm selling knockoff Buckys. On Wednesday, March 4, recently hired head football coach Paul Chryst is scheduled to give the welcome at Wisconsin Manufacturers & Commerce’s “Business Day” luncheon at Monona Terrace. WMC calls itself the state’s chamber of commerce, while critics see it as a wholly owned subsidiary of the GOP, or vice versa. No one remotely resembling a Democrat is listed on the schedule, composed solely of Republicans and Fox News or other conservative media personalities (Charlie Sykes of Right Wisconsin). Emails sent early on Feb. 27 to the UW-Madison chancellor’s and athletic director’s offices seeking comments were not acknowledged, nor were emails to mainstream media to highlight the situation. Officials were asked if Madison native Chryst, who has a five-year contract totaling more than $11 million, is rolling out the welcome mat at a partisan event as a citizen or as an official UW representative. Was Chryst directed by UW to attend? Does UW have an interest in protecting its “image” as well as images and logos that are not registered or trademarked? Gov. Scott Walker’s book and one about the protests are both titled “Unintimidated.” Photo by Lisa Wells.